When we weren't walking around the city, biking through Stanley Park, or hanging out in the whirlpool at our hotel, we were probably eating. 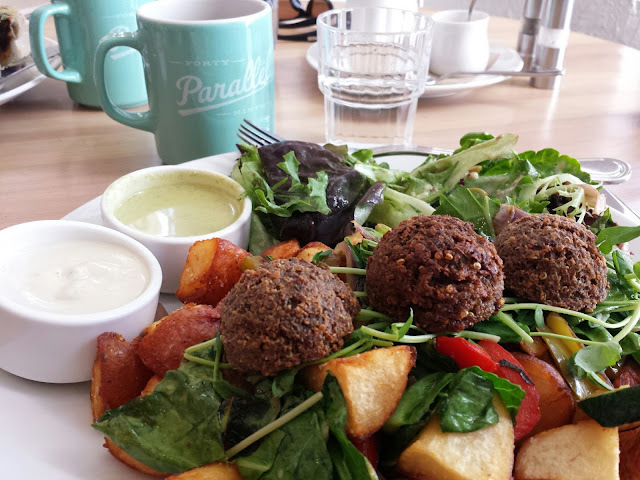 Vancouver has fantastic food and we only scratched the surface during our trip. Since I highly recommend that everyone reading this blog visit Vancouver at some point - if you haven't already - I would be doing a disservice if I didn't share our favorites. This is one place I had a meal when I was in Vancouver a few years ago for work and I was determined to bring Woody here. Go Fish is a seafood stand across False Creek from downtown Vancouver just a few minutes walk from the markets on Granville Island. Best bet is to take a water taxi over, check out the markets of Granville Island and then head over here for some delicious seafood. Okay, so I know what you're thinking... "Aren't you vegan now?" Well, yes, but no. We make exceptions every once in a while and we do eat salmon. This place has excellent, fresh Tacones (above) and other delicious options. There's always a line - and not just tourists. Tip: check out the menu then have one person stay in line to order while the other heads to the deck to grab seats as soon as someone starts to stand up. There is no shame in hovering over people on their last bite at this place! We loved this place so much we ate here twice! Dinner for our anniversary; breakfast before heading up to Whistler. 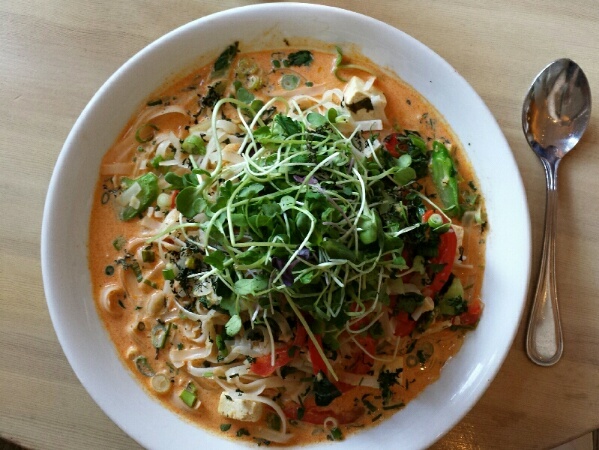 Beautiful space, great service, and absolutely delicious - and healthy - food. One side of the menu is vegetarian dishes, the other is vegan. 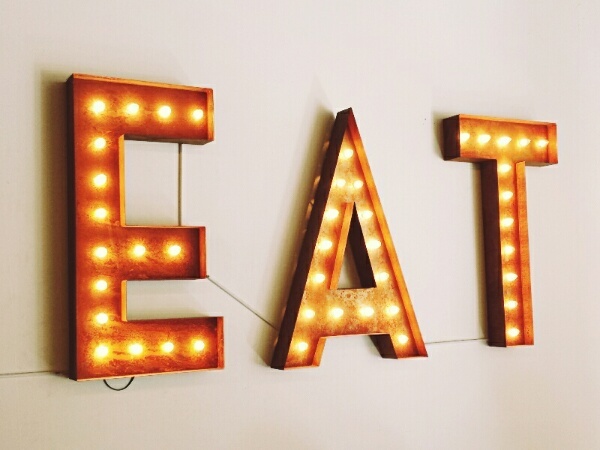 Perfect for us but really, anyone could eat here. I enjoyed the pineapple coconut curry (above) for dinner, which was so much food we also split the leftovers for a snack the next day! I chose the California Hash (below) with quinoa nut patties, collard greens, roasted veggies, potatoes and pea sprouts for breakfast which was hearty and delicious before our drive. Nuba is a delicious Lebanese restaurant with four locations; we visited the one in Gastown for dinner on our first night in town which was the perfect meal to start our trip. Among all the meat dishes, the menu indicates options that are vegetarian, vegan, and gluten free - there was plenty for everyone. We went the tapas route and enjoyed a smattering of several vegan options including the Le Petit Feast (hummus, baba ghanooj, taboulleh, and pickles), falafel, a crispy cauliflower dish, and red lentil soup. The meal was filling but light, the service was great and atmosphere lively. First thing to know is that there are two entrances to Tacofino in Gastown - the dine-in + bar Taco Bar side, and the take-out Burrito Bar side. Turns out they do not share kitchens and you can't order something from one menu if you're on the other side even though they appear to be the same restaurant. After we got over the disappointment of learning we couldn't enjoy the vegan burrito while dining in on the Taco Bar side, we did enjoy the few vegan-friendly options on the menu, including the squash and cauliflower tostada. The space is fun and lively, there's a nice sized patio and overall a great vibe. Definitely seemed like a place frequented by the 20-, 30-something trendy crowd living in Gastown but there was a diverse group of diners. Incredible gelato (yes, we made another exception!) that is a perfect treat after a day of sightseeing. Bella Gelateria has two locations - one in Coal Harbour, the other across from the marina in Yaletown (above) which also offers pizza. The line is long and the prices are a bit high, but it's worth both in my opinion - just ask for samples before you make your final choices. While searching online for vegan restaurants we came upon Cartems Donuterie, a donut heaven with regular, gluten free, vegan, and vegan gluten free options - some fried (only using coconut oil), some baked. After taking one bite you can tell the team - who make each donut from scratch using quality ingredients and no preservatives - is on a mission to make the best, most creative donuts around. While we were in Vancouver we tried a lot of donuts from Cartems, which is weird because we very rarely eat donuts, but these were just so darn good. 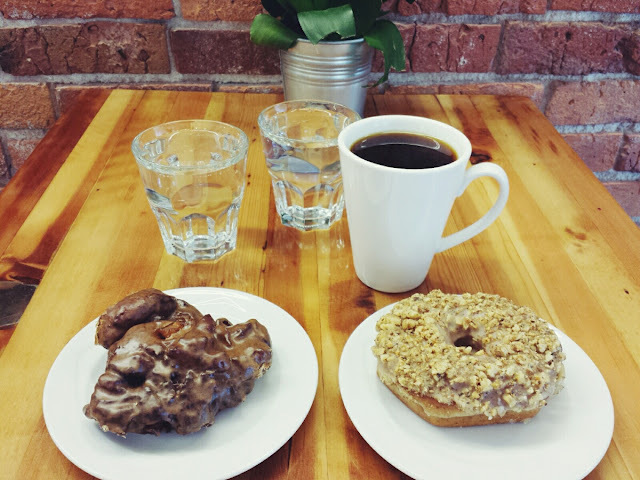 In an effort to be 100% transparent, we had: an apple fritter and maple walnut - which has walnuts smoked in-house (above) on our first visit, then Woody went back and picked up a simple chocolate glazed, the popular earl grey, and a tequila sunrise for another breakfast. All insanely delicious and addicting. It's a really good thing there isn't a Cartems location in Denver (but there are two locations in Vancouver). This is a small local coffee chain in Vancouver started by a family that's been roasting coffee beans in the city for four generations. A socially responsible coffee roaster and community member, they focus on responsible sourcing practices, being an environmentally friendly roaster and giving back. I swear you can taste this in their coffee, which is delicious. Not only do they have great coffee, but they also have great bakery items, including delectable vegan muffins. The bakery case was overflowing with so many mouthwatering items, it was kind of absurd. We split an incredibly moist piece of vegan coconut banana tea bread from the PureBread bakery in Whistler Village and a vegan chocolate chip cookie picked up from the Squamish famers market stand, but somehow never walked on the right block in Vancouver to pick something up from the Gastown location! The Whistler Village spot is a perfect place to grab something sweet (it all looked amazing), a loaf of bread, and some coffee. It's a bright, welcoming space with a few tables inside and a few outside with views of Whistler Mountain and the Olympic rings. I don't think you could go wrong with anything from this bakery. In an out-of-the-way section of Gastown with trains running just feet beyond the bar, Alibi Room was suggested to us by a fellow Oiselle Volée runner. Less for those looking for something sweet, and more something hoppy or wheaty, the selection is better, and more unique, than what you can find at other places around town. We stopped by here for a drink just as they were opening at 5pm and sat at the bar. The space is raw and industrial and the bartenders are happy to chat about the 50+ local and imported (including some great US microbrews) beers on tap and the cask beer selections. Best bet is to get a flight so you can try several. They also offer wine and cocktails, as well as a full menu. 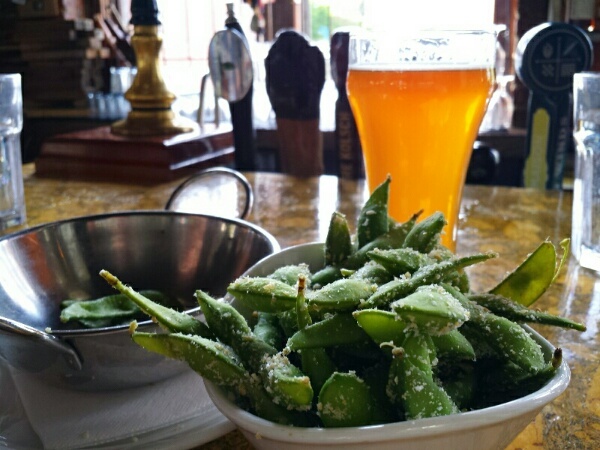 We only had edamame (above) with our beer but the plates passing us by looked pretty fantastic. As you can see, we really enjoyed eating our way around Vancouver. Thankfully we walked (and ran, in Woody's case) enough that we managed to come home without any extra weight! One thing we noticed was how accommodating people generally were at restaurants we visited when we asked for dishes with no cheese or other ingredients. Several times, at restaurants that didn't seem particularly vegan-friendly, immediately when we asked to subtract an item our server asked if we were vegan and then suggested menu items for us and automatically altered other dishes we requested. This was greatly appreciated and didn't go unnoticed. There are still a few more things I'd love to tell you about our trip, but this is long enough, it'll wait. Do you have a favorite Vancouver restaurant that I've left off my list and we should try if we go back again? * What summer vacations do you have planned? 3 Researches PROVE Why Coconut Oil Kills Waist Fat. The meaning of this is that you literally get rid of fat by eating Coconut Fats (also coconut milk, coconut cream and coconut oil). These 3 researches from big medicinal magazines are sure to turn the traditional nutrition world around!